In 2017 Jake supported Seann Walsh on his One For The Road tour. He also supported Rob Beckett on his Mouth of The South tour. He was also asked to support Romesh Ranganathan on his tour, Irrational. He was also (this is getting repetitive) asked to support Kerry Godliman on her Stick Or Twist tour. In 2018 Jake can be seen supporting Tom Allen on his Absolutely Tour. Want to see Jake live? Get your tickets now! "He's got gags to burn, and can weave them seamlessly into his routines...he's a talent." - Paul Fleckney, Chortle. "Brilliant one-liners" - Steve Bennett, Chortle. "Could easily be a TV star in a few years" - Bruce Dessau, Beyond The Joke. "Jake Lambert is smashing the circuit with his combination of youthful charm and quick gags. 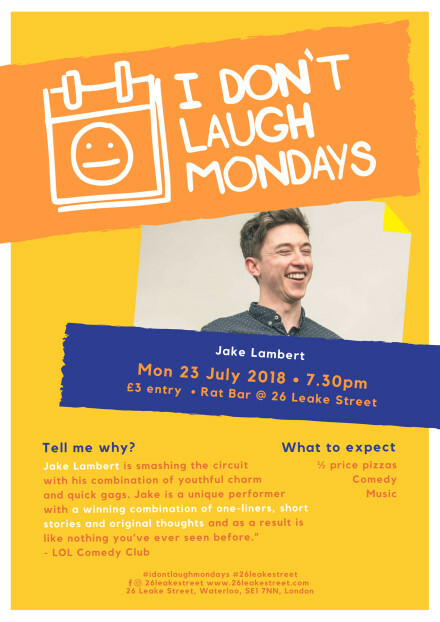 Jake is a unique performer with a winning combination of one-liners, short stories and original thoughts and as a result is like nothing you've ever seen before." - LOL Comedy Club. "He is the perfect combination of Jack Whitehall and Russell Howard with a sprinkling of Milton Jones." - Chloe Coleman.